For the last year, the Insight Center has been leading a narrative change project with a cohort of Bay Area racial justice organizations. As part of the project, each organization has been examining ways in which the language and framing we use may be contributing to harmful narratives that get in the way of moving transformative racial and economic justice campaigns and policies. Consequently, Insight has determined that the name “Self-Sufficiency Standard” needed to change. The concept of Self-Sufficiency pushes forward the harmful narrative of personal responsibility – the idea that it is on an individual to make different choices and change behavior in order to achieve economic security. It allows us to escape an examination of the way systems and institutions have been set up to place barriers on people of color, women, immigrants, and low-income families to reach their full potential and thrive. The reality is, people face economic insecurity as a result of the ways in which racism, sexism, and xenophobia are baked into our systems, institutions, and polices. It is for these reasons that we chose to re-name this tool to the California Family Needs Calculator. 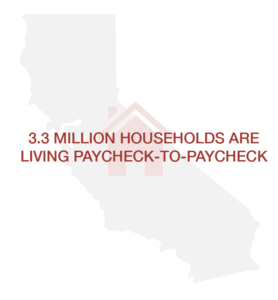 Across the state, 3.3 million households are living paycheck-to-paycheck, sleepless at night, wondering how they will pay for next month’s rent and feed their families. This reality would be hidden if we used an antiquated measure like the Federal Poverty Line to determine the economic viability of the people of California. For over a decade, in partnership with the University of Washington, the Insight Center has provided the California Family Needs Calculator (formerly the California Family Economic Self-Sufficiency Standard or Self-Sufficiency Standard) to provide a realistic and comprehensive understanding of the economic security of Californians. Many policymakers, advocates, service providers, foundations, and families use it to make informed decisions on working family issues. The California Family Needs Calculator measures the minimum income necessary to cover all of a non-elderly (under 65 years old) and non-disabled individual or family’s basic expenses – housing, food, child care, health care, transportation, and taxes – without public or private assistance. It is available for all 58 counties across the state. This tool allows you to look up the real cost of basic family needs for a specific county and household type in California. Our 2018 report, The Cost of Being Californian (PDF, 1.3 MB), highlights the initial key findings from the 2018 update of the Family Needs Calculator, and indicates that the cost of being Californian, particularly for women and communities of color, has become dangerously high. Click here to download a one-pager (PDF, 1.4 MB) about the methodology employed to calculate the 2018 Standard. Click here to download the full methodology report (PDF, 389 KB). Click here to access prior years’ Family Needs Calculator Data. Use the tabs and tools below to learn more about the health of California families and to look up the 2018 data for your area. Dr. Diana Pearce, the Director of the Center for Women’s Welfare at the University of Washington, developed the Self-Sufficiency Standard used in this report. The 2018 update to the California Self-Sufficiency Standard has been prepared in collaboration with Lisa Manzer and Diana Pierce at the University of Washington, Center for Women’s Welfare. We are grateful for their hard work and partnership. We would also like to thank Rachel Massaro, from Joint Venture Silicon Valley, and Annette Case for their insights and contributions to this update and report. This report was completed in partnership with Joint Ventures Silicon Valley. Funding for the 2018 update was made possible by Stanford Health Care, Lucile Packard Children’s Hospital Stanford, Work2Future/City of San Jose, El Camino Hospital, Santa Clara County Department of Education, Santa Clara Public Health Department, and The Packard Foundation.